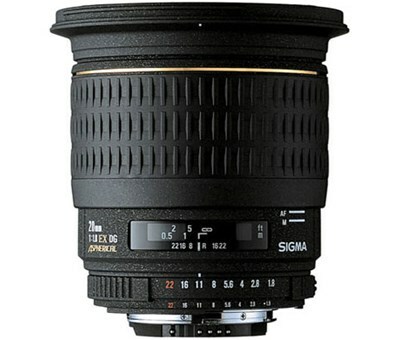 Sigma 20mm f1.8 EX DG Aspherical RF is one of several EX Series lenses. It is the first 20mm Super wide-angle lens in the world with a large aperture of F1.8 and angle of view 94.5ï¿½. It has Macro focusing capability with a minimum focusing distance of 20cm/7.9inches (reproduction ratio 1:4). The iris diaphragm has 9 diaphragm blades to obtain beautiful out of focus image. It incorporates an aspherical lens element in the front as well as rear lens groups, to minimise distortion, spherical aberration and astigmatism. The lens has non-vignetting optical construction, in order to obtain adequate peripheral brightness with open aperture. This is especially desirable for digital cameras. The lens incorporates a rear focus system eliminating front lens rotation, thus allowing the use of a Perfect Hood and easy use of polarising filters. The lens also incorporates dual-focus mechanism. It is easy to hold the lens, since the focusing ring does not rotate during auto-focus, yet it provides adequate focusing torque of the focusing ring during manual focusing of the lens. The lens materials used in this new lens are lead and arsenic free ecological glass.